Welp, that didn't take long. Chrissy Teigen just created the first viral moment of 2019. And she did it when the new year was merely a second old. Teigen appeared on NBC’s New Year’s Eve telecast on Monday evening, where she counted down to the new year with Saturday Night Live star Leslie Jones and Today‘s Carson Daly. Typically, we'd be wondering why on earth a single person would ever go down to Times Square to watch the ball drop in person around this time. However, instead of shaking our heads over the thousands of revelers in the background of the clip featured here, we're laughing our rear ends off over what transpired between Teigen and Jones. You see, when the hilarious social media user and mother of two went in to hug Jones … she was accidentally smacked in the face by Leslie's umbrella. "7am. Heading back out to Time's Square to find my eyeball." "Ugh I can't believe I hit @ChrissyTeigen in face!! Lordt!! I love you boo!! So Sorry. #ThatsWhyIHateUmbrellas." Perhaps, however, this moment was actually planned in order to serve as a distraction from the mini controversy Teigen stirred up when she mentioned vaginal steaming on the show. In response, some viewers complained that the subject wasn’t appropriate for a telecast many were watching with they’re young kids. “Maybe I’m old but not that old. Watching NBC with my 12 year old 20 min before the ball drops and Chrissy Teigen starts talking about vaginal steaming. Really?! "The host of NYE…vaginal steaming? Come on…have a little CLASS. Too many families watching honey. Not cute." 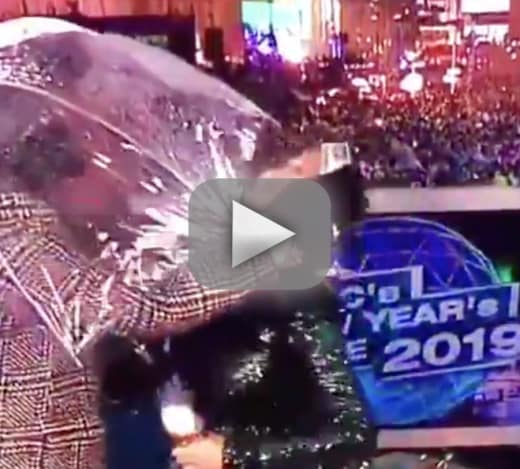 Ponder the answer while you watch Teigen gets destroyed by the umbrella in this footage. Toddlers & Tiaras: Where are These Poor Kids Now? Big Brother Recap: Did Brett or Winston Escape the Block? Next story Married at First Sight Premiere: Who Got Hitched?